The purpose of the Independent Living Skills (ILS) program is to increase the capacity of individuals with disabilities to become and remain self-sufficient. Whether newly disabled or a person, who is aging with a disability, use of adaptive skills, access to resources, and support from peers is essential to sustained well-being. Any person, who has a disability and lives in the southern portion of Orange County, is eligible for services through the ILS program. Usually, consumers are eighteen or older. For more information about the ILS program call 714.621.3300 or complete the online form. Potential consumers learn about independent living skills training through the Dayle McIntosh Center from other organizations, friends and family, word-of-mouth, social media, and outreach events. A formal referral process is not required for participation in the ILS program. During the intake process, individuals complete a self-evaluation to determine current level of functioning, potential abilities, and required support. The results of the assessment and needed assistance are discussed with each consumer. An independent living plan (ILP) or goal statement is then developed for the purpose of defining service and training objectives, related timelines, and desired outcomes. The plan is used as a guide for services. Adjustment Counseling: Exploration of feelings attitudes and values which may impact the attainment of personal goals; accurate assessment of strengths and limitations; and advancement of a philosophy of pride and self-worth. Self-advocacy: Training in areas such as decision-making, problem-solving, assessment of potential risks and consequences, and mediation to gain needed assistance. Health and Hygiene: Being well groomed, maintaining medications, developing healthy habits, scheduling routine examinations. Daily Living Skills: Performing housekeeping tasks, doing laundry, shopping, preparing simple meals, arranging transportation, following safety procedures. Social Skills: Interacting with others, using effective communication, engaging in the community. Assistive Technology: Demonstration of appropriate use of various assistive devices. A 54 year old female who has multiple mental health diagnoses is an ongoing consumer in the ILS program in South County. 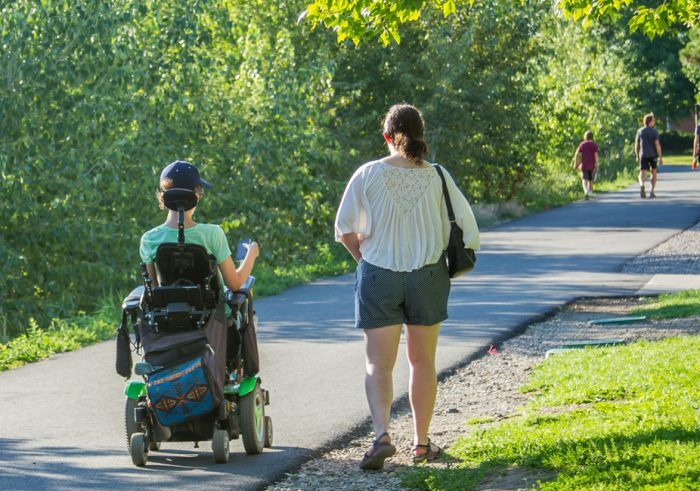 Her disability affects her capacity for managing daily living activities such as budgeting, processing applications, scheduling appointments and maintaining employment. The consumer has not been able to receive the mental health services that she needs due to poor time and task management. With assistance from the ILS program, the woman has been able to establish multiple goals such as improving organizational skills and engaging in self-advocacy and self-empowerment activities. The consumer is motivated to gain control of her own life and has developed strategies to maintain a calendar and use reminder techniques to complete daily tasks. She is actively participating in a monthly peer support group and joins in discussions. With continued support and involvement in DMC programs and services, the consumer will continue to grow and her independence will flourish.